Max de Esteban’s gorgeous new monograph brings together all three parts of his stunningly beautiful “Elegies of Manumission” series. Making use of portraiture as a conceptual tool, de Esteban's portraits, of architectural quality and extraordinary craftsmanship, build a narrative beyond the anecdotal and push the boundaries of contemporary portraiture. 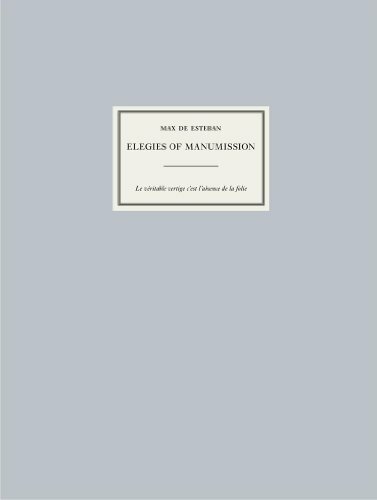 Open to many interpretations, “Elegies of Manumission” questions the construction of identity of the individual subjects portrayed. This oversized (11x14-inch) book is beautifully printed on uncoated Japanese stock, and bound in Japanese cloth. The first edition is limited to 1,000 casebound copies. Max de Esteban is a recipient of a Fulbright fellowship, holds a Ph.D. from the Universitat Ramon Llull, and a Masters degree from Stanford University. His work has been exhibited internationally, and has received several prestigious awards, including the Grand Prix Jury's Special Award at Fotofestival 2010 in Poland and the National Award of Professional Photography – Gold Lux in Spain that same year. Max de Esteban lives and works in Barcelona, Spain.